Oh my god - this is cheese heaven!!! Its creamy, rich, luxuriant, slighty smelly, and so so good! You may have noticed I am very fond of this cheese. Its a French cheese from the Champagne-Ardenne region and has a smooth creamy buttery texture with a slightly more tangy crumbly core. Its rind is distinvtive & rippled with an orangy colour to it. There is a deliberate dimple in the top of the cheese as traditionally a small pool of Champagne is poured so when you cut the cheese the champagne infuses into the cheese - shame I dont have a bottle of Champagne knocking about!!! If you want to try a truely delicious cheese - then this is HIGHLY recomended by The Mighty Cheeseboard. In fact it is Marc de Champagne that is poured into the concave area at the top of this cheese. Marc de Champagne is a type of brandy made by fermenting grape skins, pips etc. (the stuff the wine makers throw away). 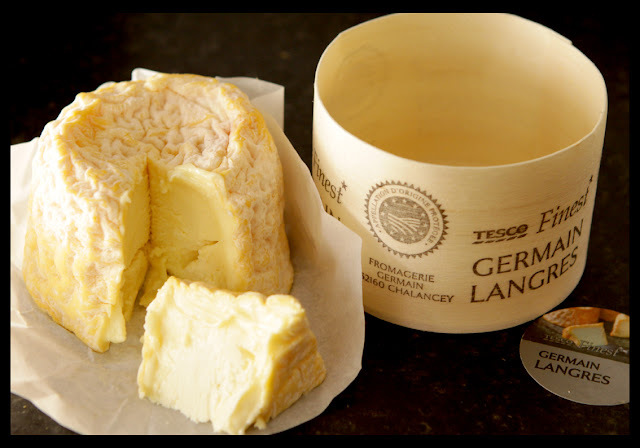 Anyway, I haven't had this cheese since I lived in France, so will try Tesco's Germain Langres on your recommendation.